"What do I do? What am I supposed to believe in now? Are you going to tell me? Well are you?" "You need to figure that out on your own. Stand up and walk. Keep moving forward. At least you have strong legs to take you there." The silhouette is really cool, and yet you can still see some of the color differences. I like silhouette pictures lol. It is a bit different lol, but I like how it turned out too. Thank you! Great cosplay! The sunset is gorgeous, the plants really add to the background instead of detract from it, and you can tell immediately that you're Ed, just from the silhouette. 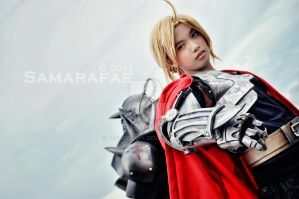 And you even have his little hair cowlick-thing Amazing job-- one of the better Elric cosplays I've seen!